Born and raised in Texas, Mark graduated from Georgetown University in Washington, DC, with majors in painting and American Studies. Thereafter, he began his professional career as a painter and craftsman focused on the way that artworks mediate between different social and personal landscapes (public/private, urban/rural, black/white, now/then). His desire to ground his expressive practice in a rigorous understanding of what art is and does in various cultural contexts then led to M.A. and Ph.D. degrees in American Studies from the College of William & Mary, and a stint doing curatorial research at the Virginia Museum of Fine Arts. 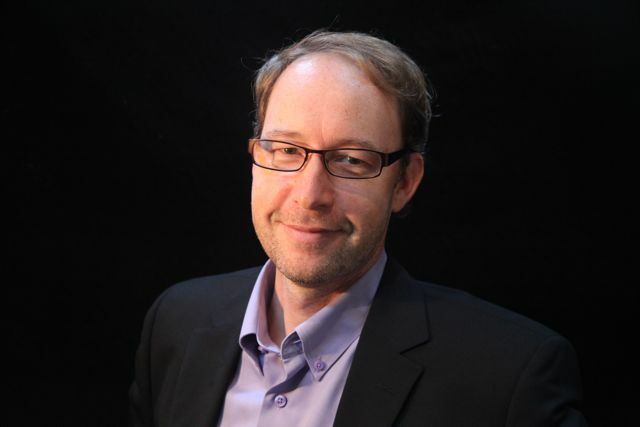 He and his wife, Beth, moved to Richmond, VA in 1992, where they continue to live and work with their three sons. Mark’s work can be found in public and private collections across the US, in Great Britain, France and China, and he draws upon his combined practical and academic experience to encourage critical engagement with the meanings flowing from the myriad artworks and images that make up our contemporary visual culture. My process begins with time spent – camera in hand – with the animals and their keepers, particularly at the agricultural fairs and shows where the dynamics of preparation and judgment are most intense, but also in the barns and paddocks of farms in Virginia. In these places, my aim is to hear as much as to see: to understand the relationships between the animals and their keepers while also recognizing images that are beautiful, powerful, or both. Back in the studio, I rework these photographic sketches – cropping, framing, eliminating the non-essential elements – and transfer a pencil sketch to the canvas. From there it becomes very much a traditional process of painting, with the requirements of the developing object/image directing the choice of color, texture, and compositional changes. The same process holds for my works on paper, whether water colour or acrylic, but these smaller works are often also developed as small-edition, hybrid-digital prints, for which I do the scanning and color correcting before printing on an archival digital press, usually in editions of 50 or less. Afterwards, I re-work each print with acrylics before signing and numbering them. Prints are available either unframed or in archival mats and frames. Though they are often chosen and begun while a sketch is being developed, frames are custom built for each painting after they are complete, beginning with raw lumber or architectural molding which my wife and I mill in our shop, often with the help of our sons. After each frame is built, we hand-carve it, then Beth takes over the preparation for and gilding of the piece. I come in again for the final glazing and fitting the frame to the painting. Animal emblems have long offered a rich visual language by which to imagine and represent the complexity of human social, interpersonal, and spiritual relationships. Though about half of my work features architectural and landscape subjects, these animal images perhaps best represent my underlying interest in how images (and paintings) are transformed by different frames of reference: I take animals as my subjects precisely because they seem out of date and out of step with contemporary suburban culture, yet retain their power for story-telling. 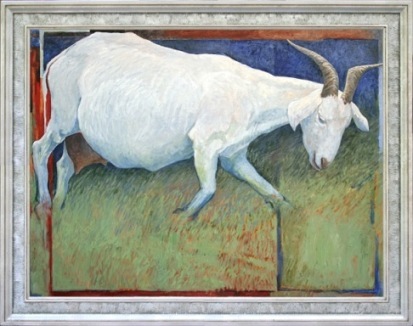 By translating elements of the rural allegorical tradition and depicting scenes of contemporary husbandry practices, I bring forward ancient, seemingly-familiar, but now alien imageries (like shepherd and sheep) to call to mind questions of identity, compassion, nurture and justice, as they are refracted through the various cultural lenses we all wear. And by wedding my paintings to hand-carved frames of our own crafting, I also seek a link with the tradition of the ikon, in which concrete image-objects were understood as pointers to the divine presence rather than ephemeral signs or decorative trinkets—means of contemplation and communion, rather than of self-expression. Well-worn, 2007, Oil on Canvas, 24" x 30". Hand-built, carved and gilded frame. In the world of fairs and stock shows, fitting is the process by which a shepherd makes a sheep ready to be brought before the judge. 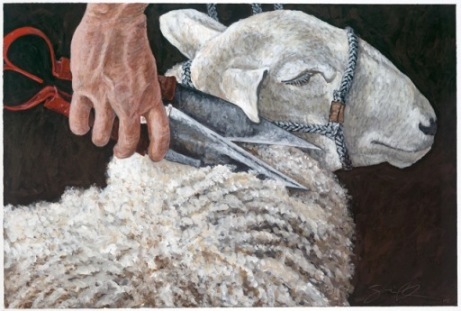 With its several stages of washing, grooming, and finally covering the sheep to preserve the work that has been accomplished by its keeper, the contemporary practice of fitting is a suggestive analogy for the ongoing and active relationship between Christ and the members of his own flock. Just as the Biblical parable of the wedding guests who wait for the Bridegroom to arrive was full of expectant uncertainty, sheep sometimes wait a long time between being readied for the ring and actually going in before the judge; Well-worn extends this imagery to suggest that though waiting for the Groom’s return remains a commitment of unknowable duration, there remains beauty and dignity even (perhaps especially) in a garment frayed at the edges from long and regular use. Either/Or, 2006, Oil on Canvas, 24" x 36". Hand-built, carved and gilded frame. An exploration of the way abstract use of color and form can carry meaning forms the background for Either/Or, which is a meditation on the symbolism and practical experience of the scapegoat. 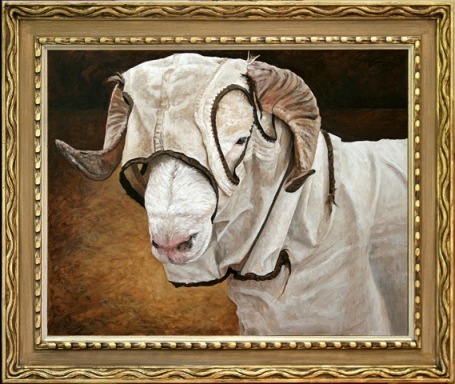 This spotless goat was to be identical to the goat offered in the Temple as an atonement sacrifice, only distinguished from the other by a casting of the lot. Neither animal seems aware that it is at a moment of decision, but by positioning the viewer in the close perspective of a participant in the ritual, I intended to invite such questions as, “Which will it be?” “Is this fair? “Are not both animals lost in the end, anyway?” “What is my role?” All are questions whose answers are transformed by the sacrifice of Christ. Magnificat, 2006, Oil on canvas, 33" x 44". Hand-built, carved and gilded frame. As with medieval stained glass windows that presented spiritual history and doctrine via a beautiful iconographic shorthand, Magnificat makes use of the potential for color and shape to carry the symbolic meaning of a complex moment: the ecstatic poetry of wonder and submission with which Mary celebrated the incarnation. While the color red connects the biological birth of the new Adam with the violence-stained earth (Hebrew, adam), blue—the color of God’s space breaking into our own—frames separately both Mary and the child she carries, while also (in the corners, like the tassels on the “wings” of a rabbinic robe) alluding to the healing and teaching ministries of Jesus. Gleaners, 2008. Oil on canvas, 30" x 30" Hand-built, carved and gilded frame. 20” x 20” image size: $320 (edition of 25). 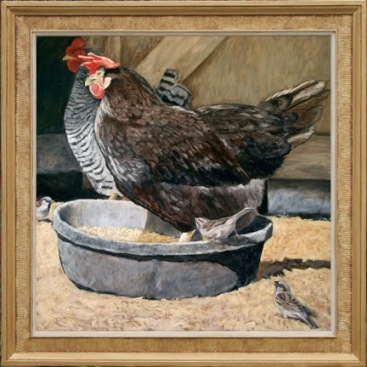 Gleaners makes use of hens and sparrows to picture the contrast between the attitudes of greed, generosity, and thankfulness. The chickens in the yard are the rightful recipients of the grain that miraculously appears in their bowls each day, but the scene of the large central hen standing in the midst of the bowl and trying to keep the smaller birds from claiming even a few kernels of corn seemed to me an apt metaphor for human patterns of thought and action when confronted with others asking for a share of what they did not “earn” and that we possess. Fitting, 2008. Acrylic-modified digital print from original acrylic, 10" x 15". When the State Fair brought Virginia’s flocks to her capital city each October for judging, the process of fitting began with a thorough washing of the sheep to remove the accumulated grime acquired by the animal during its life in the field. The most critical stage, however, is when steel shears move over the coat of the sheep, trimming and shaping the fleece until it conforms to the ideal envisioned for it by its keeper. Though the animal sometimes resists the restraints placed on it during this crucial stage of preparation, both the binding and the cutting reflect the shepherd’s love of the sheep and desire to show the animal at its best and most worthy. Cotswold, 2008. Acrylic-modified digital print from original acrylic, 6" x 6". Cotswolds are the local sheep in the Cotswold hills of Gloucester in southern England, which region gets its name from the old practices associated with sheltering (in “cots” or “cotes”) and grazing the sheep (in the hills or “wolds”). Distinguished by their long, curly wool, carried in distinctive locks that can often fall down over their eyes and faces, in the U.S. they are prized by contemporary spinners and weavers and shepherd as much for their looks as for their wool. 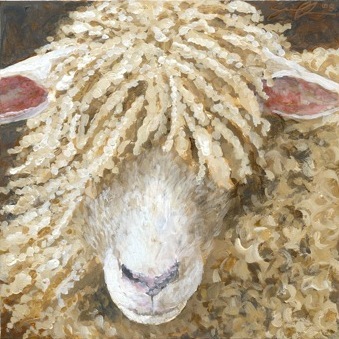 Cotswold is one of a growing set consisting of portraits of some of the many diverse breeds of sheep I’ve encountered over the last few years—each with its own distinctive look and character. 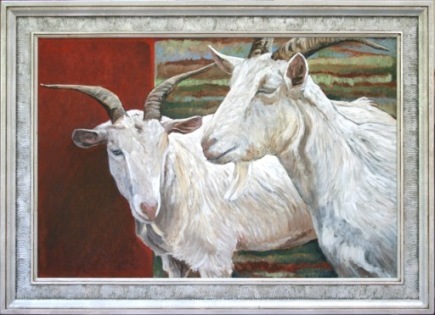 Considering the long history of domestication and more recent interest in retaining rare and old breeds, the original nine paintings in the series constitute the down-payment on an on-going project. The rest may be seen under the "Prints" section of my website.